Whilst the Ross Revenge was at sea the power generation contained with this room could easily have powered a small village. As high load equipment, such as the transmitter cabinets, are no longer in use these days the larger generator sets have effectively become redundant - with broadcasters and crew now relying on rotational use of the smaller 10kVA - 20kVA and 50kVA generators. The links above look at the specifiations for all of the Generator Room sets currently employed onboard Ross Revenge. 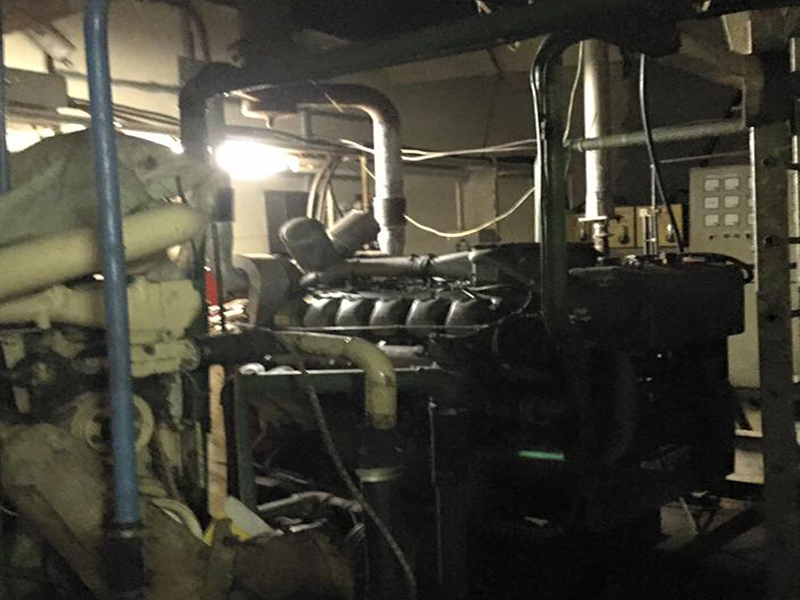 The Generator Room onboard Ross Revenge is situated at lower deck level, at fore end of the ship behind what was previously the fishing crew accomodation. When the ship was orginally built the existing Generator Room (together with the Transmitter Room) were the hold areas for both the fishing catch and fish processing. As you may have noted from other sections on this site all power generation at the time of the initial build was provided by DC generators - and this continued throughout the Freyr / Ross years up until the Radio Caroline aquisition in 1981. On arrival in Santander Ross Revenge was fitted out with AC power generation to accomodate the transmitters, broadcasting equipment and day to day essentials whilst still maintaining many of the ships required DC electrical systems. Even to this day both AC and DC electrical systems still sit side by side .... albeit DC electricity these days is provided via rectified AC. The first two AC generators brought into use were 6 cylinder MAN engines driving 250kVA three phase Stanford alternators, situated on both Port and Starboard sides of the Generator Room. A third generator set was later introduced (located between the two 6 cylinder sets), a huge V12 MAN twin turbo engine, driving a 500kVA Stanford alternator. All three of the MAN generator sets were salt water cooled via heat exchangers with freshwater header tanks (one per engine). In essence, hot water was passed through a heat exchanger and cooled by sea water (taken from the intake sea chests within the Engine Room), before being discharged overboard. Both the Port Side 250kVA MAN and centre position 500kVA MAN generator are still in their original locations, however they are no longer in use. The Starboard 250kVA MAN having given many years of service has been replaced by a more economical Perkins 50kVA genset, referred to by both Crew & Broadcasters as 'The Black Perkins', which is also supplemented with a Perkins 20kVA set and a 7kVA Lister set.